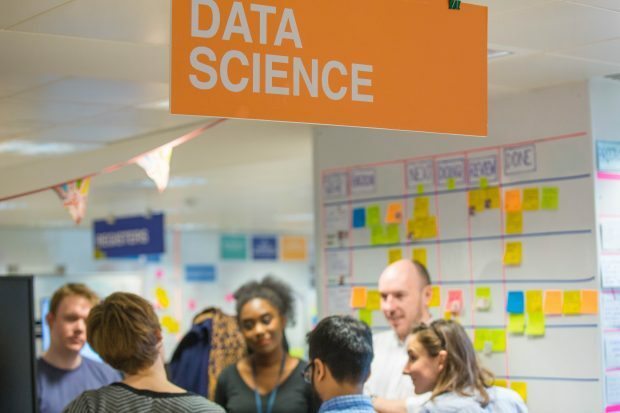 The Data Science Accelerator, now in its third year, is a capability-building programme which gives analysts from across the public sector the opportunity to develop their data science skills by delivering a project of real business value. The Accelerator runs every four months and the call for February 2018 applications is now open. We are pleased to announce that the UK Hydrographic Office in Taunton will now be joining the Accelerator as a hub specialising in geospatial projects, enabling aspiring data scientists in the West Country area to take part in the programme and benefit from learning new skills and approaches to tackle real public sector challenges. The programme is backed by GDS, the Office for National Statistics, Government Office for Science, and the analytical professions (statistics, economics, operational research and social research). Now is your chance to apply as a participant. Participants consistently tell us what great opportunities the Accelerator has given them. Why not take a look at our blog posts about past projects? Many begin as proof-of-concept, with some becoming a part of everyday business for departments. Each participant has the option of using a laptop to download relevant software onto (if required) and a mentor. Participants are expected to commit at least 1 day per week for 12 weeks, and we encourage you to spend that day at one of the hubs (London, Manchester, Newcastle, Newport, Sheffield, or Taunton). At the end, you present your work to other participants in the programme, as well as at conferences organised by your profession. The most important thing we look for are high-value project ideas, enthusiasm to try new things, and dedication to the course. Your line manager and a more senior manager (usually a Head of Profession or equivalent) must agree that your project tackles a business problem with data, and that you can commit to the time requirements. You must also have access to the data you need. Coding experience is desirable but not essential. Please email this form to data-science-accelerator@digital.cabinet-office.gov.uk by Monday, 19 February 2018. The programme will start on Thursday, 8 March 2018. Thank you for sharing useful information for all the candidates of Datascience Training who want to kick start these career in this field.